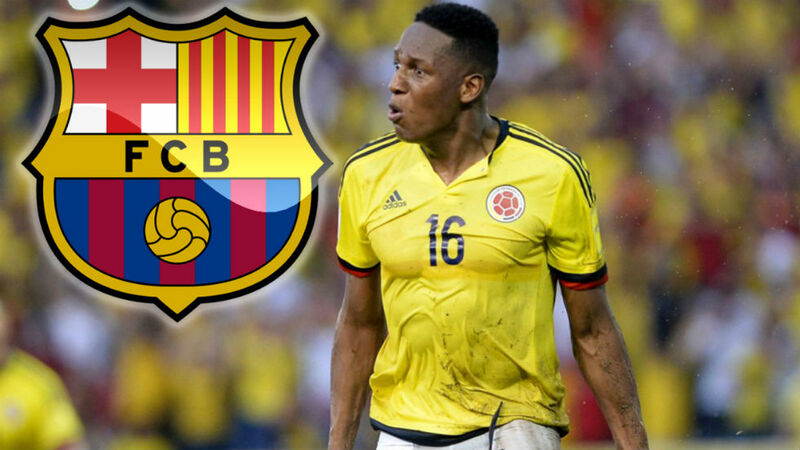 Spanish soccer giants Barcelona look set to capture the services of promising young Colombian defender Yerry Mina, according to Spanish media outlet Diario AS. The 23-year old is expected to arrive in Spain this week to complete a medical and finalize the terms of a contract after the Catalan club agreed a fee believed to be in the region of $13 to $14 million with Sao Paulo’s Palmeiras – a portion of which will go to Bogota-based Santa Fe. Barcelona had agreed a deal to bring the Colombian star to the Camp Nou in the summer but manager Ernesto Valverde is anxious to bolster his defensive options amid the imminent departure of Argentina’s Javier Mascherano and thus offered to increase the fee paid to the Brazilian club to secure the player in the January transfer window. In an ever inflating transfer market, which saw Liverpool shell out a staggering $100 million for Dutch defender Virgil van Dijk last week, the Barcelona hierarchy will satisfied with the capture of the Colombian who has already been compared to Gerard Pique. Cauca-born Mina began his career with Deportivo Pasto in the Colombian League, making his debut in 2013, going on to represent the club 24 times before being snapped up by Bogota’s Santa Fe the following year. Mina’s athleticism, aerial threat and technical ability on the ball saw him immediately impress in the Colombian capital, making 52 appearances for “Los Cardenales” in his first season. The center back went on to win Colombian league and Super League titles with Santa Fe, also securing a Copa Sudamericana, South America’s equivalent of the Europa League in 2015. Mina joined Brazilian club Palmeiras in May 2016 for a fee of approximately $4 million and made 33 appearances for the club, notching up eight goals and two assists. The Colombian international improved the defensive solidity if the Palmeiras side and provided additional aerial prowess in attack as they went on to win the Brazilian championship. Mina was subsequently selected on the Brazilian championship Team of the Year for 2016. Colombian coach Jose Pekerman acknowledged the consistent performances of Mina by awarding him a debut for the national team in June 2016. Pekerman recently described Mina as “one of the greatest revelations of today’s football,” as he spoke in advance of Colombia’s 4-0 defeat of China in an international friendly. Mina has subsequently made 9 appearances for “Los Cafeteros,” scoring three goals and is likely to be an essential part of the national team’s efforts at the World Cup in Russia this summer. Indeed, with youth on their side, a central defensive partnership of Mina and Tottenham Hotspur star Davinson Sanchez could be on the cards for a number of years to come.